Not everybody needs a big bulky ironing board, and many of us don't have the room even if we wanted one. 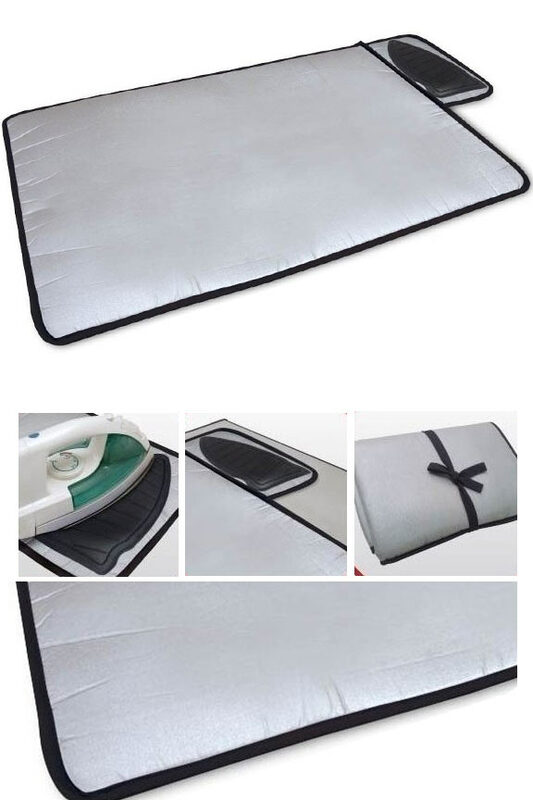 This fold-able mat is the perfect item to allow you to iron clothes in any location. It's ideal for folks living in cramped quarters, but also great for anyone that may need to remove wrinkles while away from home. The large pad has extra foam padding to prevent heat transfer, and the whole thing folds conveniently when not in use. A silicone pad is perfectly positioned to provide a safe resting spot for your iron when you need to set it down, and integrated ridges make it cool faster when you place it there. Use on any flat surface where there is enough room and quickly take care of your ironing without dragging out a monster size board or using a towel or blanket on the floor. Heat resistant material will keep surfaces safe, and the non-slip resting pad will prevent your iron from falling over, sliding away, or harming surfaces due to hot metal. The fold up design makes this product perfect for almost any situation. At home it allows you to store it in a closet or on a shelf when you don't need it, but when not at home it is even more useful. Pack into a suitcase to take with you on vacation or business travel, or store in your RV to add convenience and utility where space is limited. If you don't have a regular laundry room then adequate ironing space is probably non-existent, but now you will be able to transform any flat area into the perfect place to remove wrinkles or press your shirts. If you sew or quilt on a regular basis, it can be quite convenient to stow this mat right nearby to prevent leaving the room or setting up something more substantial just to press a small piece of fabric. Simply unfold right where you are sitting, quickly get the job done, and the re-fold to get back to your project. Other mats may be able to get the job done as far as providing a heat resistant surface, but this one takes it one step further by giving you a great place to set your iron down, or let it cool after the job is done too. An additional portion of mat has a silicone pad on top that provides an ideal parking spot because it can handle temperatures up to 500 degrees and it keeps your iron from sliding. Added ridges will elevate the metal so that air flows better and the unit cools faster. Because you can set it down horizontally instead of upright, it will be far less dangerous because it can not tip over accidentally. Use it to rest between garments, or use it as a cooling station for when the work is finished. Unfold and lay down on any flat surface. Works great on a bed or table, on the floor, on a counter, on top of your dryer and more. For best results, ensure that the surface is firm and level. Place clothing on top of mat and spread out into a single layer. Plug in and preheat iron according to directions. Proceed to remove wrinkles, steam and press like normal. Use silicone pad to rest iron when rotating or switching garments. Use resting spot to set down on metal face after you finish to allow for cooling. Fold for storage or travel. An integrated tie will hold it shut when fully compacted. Lightweight design allows for easy portability, and transport in almost any manner. If soiled, wipe clean with damp rag. Uses Unfold to create a safe workspace for ironing. Use silicone pad to rest iron when not in use. Compatibility Works with any iron type. Large size provides enough space for any type of clothing. Use on any flat surface. Foldable Yes - Easily collapse for storage or travel. Pad Material Cotton With added foam padding for increased insulation. Get rid of wrinkles anywhere. This convenient pad allows you to iron clothes on any flat surface without risk. Block the heat and give yourself a spot to set your tool. Fold for storage or travel. Order Yours Today! The mat is disappointing because I thought it would be thicker. heavier. I wouldn't use it on a surface that might be damaged by heat. I use it on a tile counter. The size is what I wanted and the iron rest is a good idea. This mat works perfectly for use in our church when making banners. It gives the wider surface needed for our projects. Works well for quick touch-ups.Blouses,sweaters are easier to work with than slacks.Doesn't take the place of ironing board. I am very please with the Portable Ironing Mat with iron rest. Another wonder feather is you saved time. Never liked the time I had to spend ironing when everything wrinkled. Now most materials are "iron-free" or only require a little touch-up, and this mat is perfect for that ... and much easier to store than the traditional old ironing board. Is this mat weighted so that it won't slip all over the counter top? Most users don't have a problem with sliding due to the material and natural weight, but no, there is no extra weight to specifically prevent this. Silicone Iron Rest - Get the resting spot without the pad. Also features a built in funnel that conveniently collapses when not in use. More Laundry Stuff - Find other great products to make washing clothes easy. A Safe & Non-Toxic Alternative to Fabric Softeners & Dryer Sheets!